After the DC Convention Center opened, people were surprised that it didn't result in improvement on 9th Street NW, an old commercial corridor that had long since seen better days. I responded, making the point that besides the fact that the Convention Center wasn't designed to connect to the community outside of the building, if you wanted the street to improve, you needed to invest money in its improvement in advance of the Convention Center opening, so that there were functioning businesses there to serve the hordes. That didn't happen. 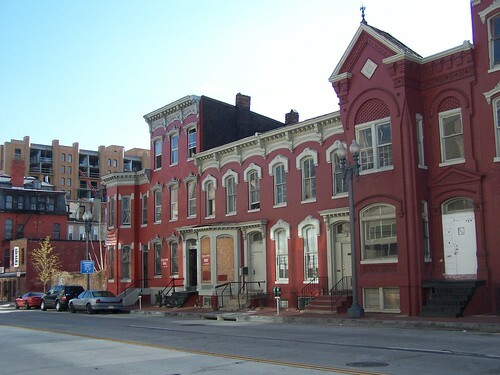 In fact, I think it's a travesty that the revitalization of the historic commercial buildings along 9th Street NW between M Street and Rhode Island Avenue wasn't specifically required as part of the development of the Washington Convention Center. Beleagued Be Bar between two vacant disinvested buildings on the 1300 block of 9th Street NW. Why would people be enticed to walk outside the Convention Center to explore the neighborhood, when the commercial district looks bombed out? 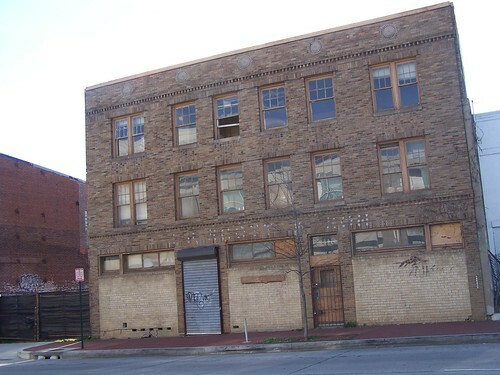 Rehabilitation of the extant buildings on 9th Street should have been the focus of retail development for the Convention Center first, not the spaces within their own building, which will be focused on keeping people in the Convention Center rather than "letting them out." A couple years ago, in response to an article about the failure of retail spaces within the Convention Center, I wrote about this topic again, making the same point. 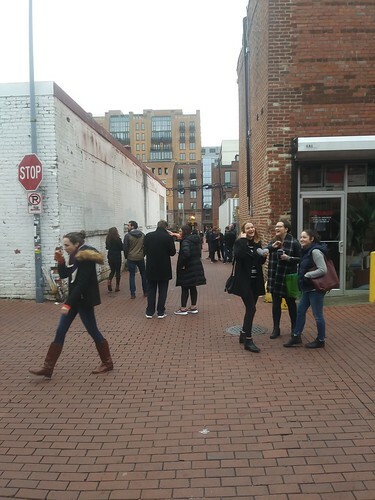 But this weekend, I was briefly in Blagden Alley and 9th Street NW was markedly different. Most of the commercial buildings in the corridor have been rehabilitated, here and there is infill mixed use development of a larger scale, there were interesting businesses in many of the spaces (mostly food and drink related), and there were tons of people on the street and in and around Blagden Alley specifically. 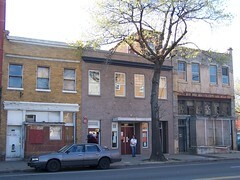 This photo of the same block in 2006 doesn't look so bad. But that wasn't the case for most of the street back then like this section of the same block, which was pretty typical. I would assert that the improvement hasn't happened because of the Convention Center, or because they finally opened a Convention Center Hotel on Massachusetts Avenue. Although the CC is finally fixing some of the problems with the retail spaces, and the 9th Street side of the complex has two heralded restaurants, the Unconventional Diner and Smoked and Stacked, a sandwich shop. Both continue to be acclaimed and are likely to be successful for the long haul. There's also a Union Kitchen Grocery, which claims to sell local foods, but it appeared to me that most of the items sold there wouldn't meet the definition. It's happened mostly because DC has added population, especially in new mixed use buildings in the core. 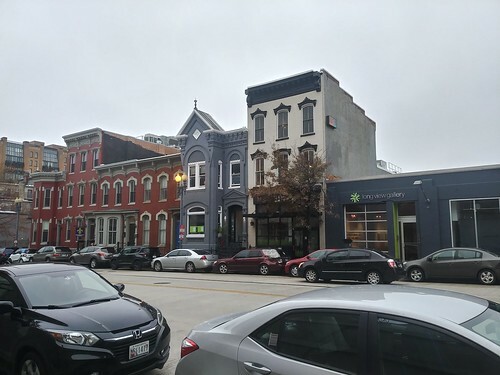 Also in that area specifically, the O Street Market (between 7th and 9th Streets) was redeveloped into a mixed use space with apartments, condominiums, and a hotel as well as a renewed Giant Supermarket and some other retail, which has helped to stoke both streets. But if DC hadn't added population in the last ten years, without a focused investment program in the area, I wonder how much change there would be even today? It would be the Convention Center and the Convention Center Hotel and likely very little else. Key is population in that neighborhood, plus a demographic willing to spend $13-$15 on one drink. From RI to Mt. Vernon Sq, 9th ST NW has developed into a foodie zone catering to a crowd that likes the edginess or the idea of edginess that the bombed out structures provided. Starting with Corduroy in the 00s. Then the now gone ventures of Rouge 24 (yeah Blagden Alley), Seasonal Pantry, Vegetate, and that obnoxiously expensive restaurant near the Carter G. Woodson House. Not so much food but drink-wise you had the Passenger across from the Convention Center, but they didn't seem to go for the out of towners. Most of the foot traffic I see with the obvious convention badges head south into Gallery Place. The Convention Center is a presence, but not really a major influence in the development and improvement of the 9th Street corridor. Looks like 9th street is finally happening. I thought about using this photo instead.